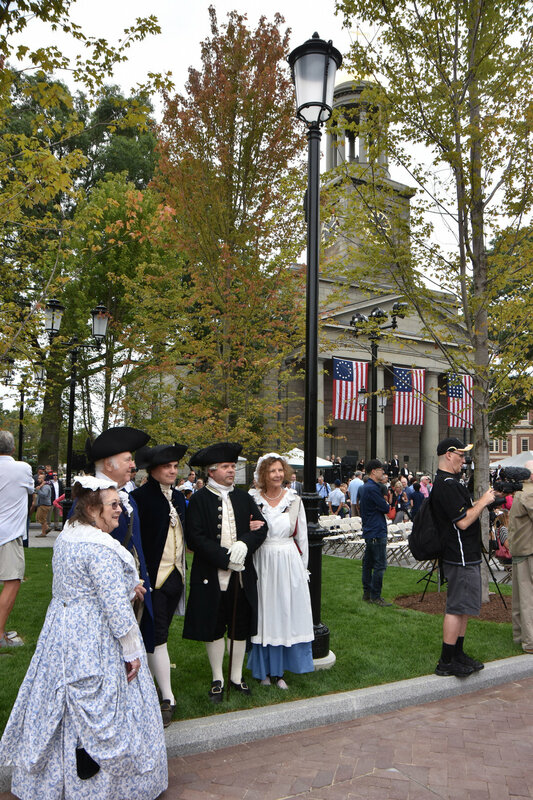 The new Hancock Adams Common, designed by Halvorson Design Partnership for the City of Quincy, opened this month with a celebration that featured speeches by Quincy Mayor Thomas Koch, Governor Charlie Baker, Pulitzer prize-winning historian David McCullough, and Congressman Stephen Lynch, music by the Quincy Symphony Orchestra and the Quincy Choral Society, Colonial reenactors, a giant cake made in the shape of the park, and cannon blasts organized by local members of the US Army. Montilio’s Bakery in Brockton created a replica of the park in cake form. A crowd of more than 2,000 people came together to witness the unveiling of this long-awaited open space, which rerouted a busy four-lane city street and replaced it with a new park, tree-lined pedestrian mall, and plaza that pays tribute to the city’s history and ties together three of the city’s most iconic historical landmarks, Quincy City Hall, Hancock Cemetery, and the United First Parish Church. Serving as a new “front yard” for downtown Quincy, Hancock Adams Common features open green spaces, a shaded promenade, ornamental plantings, and three fountains, including a tidal fountain that transforms from a calm reflecting pool to a grand showcase of water featuring 10-foot sprays. Capped on either end by bronze statues of John Adams and John Hancock—made by artist Sergey Eylanbekov, who also worked on the Dwight D. Eisenhower Memorial in Washington, D.C.—the pedestrian promenade offers a shaded path through the new 3-acre space with custom-designed benches that invite residents and visitors to sit and relax. Mayor Koch sees the Hancock Adams Common as the first step in transforming downtown Quincy from a nine-to-five shopping district into a thriving 24/7 neighborhood. His hope is that a revitalized downtown will attract new restaurants and stores and serve as a catalyst for future development in the area. 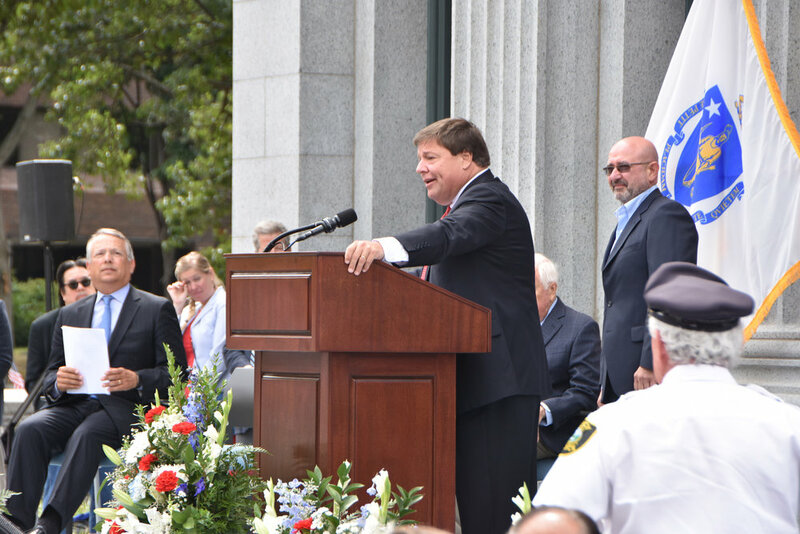 Check out additional coverage of the opening by The Patriot Ledger, The Boston Globe, Boston.com, WHDH, WCBV, The Metro. and catch our own Rich Houghton who spoke to CBS Boston.